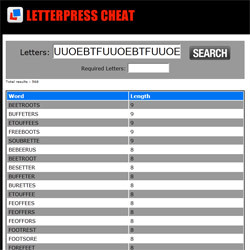 This Letterpress Cheat Guide will help you find your way around the game Letterpress and educate you on how to use this site to cheat, as well as providing general pointers on gameplay and strategy. This cheat guide is the definitive source for helping you win every game of Letterpress. This entry was posted on Tuesday, November 6th, 2012 at 1:41 am	and is filed under Letterpress News. You can follow any responses to this entry through the RSS 2.0 feed. You can leave a response, or trackback from your own site. WHAT IS THE POINT OF PLAYING THE GAME IF YOU ARE GOING TO F**KING CHEAT? I really like your letterpress cheat website. It’s fast and reliable and that’s important.. There’s one thing I would really like to see improved. If I enter required letters, it only finds words with those letters in that exact order. It would be much better if it could find words with the required letters in ANY order. Can that be done? Why are you here Joel D.? To not cheat? No. You’re a cheater so shut your face. There seems to be something wrong. I entered 25 letters that included a B, an O, and an X. The I put B and X in the required letters field and it said there were 0 results. What about BOX?